The Cloth Diaper Report is giving away a variety of cloth menstrual pads from various companies in a Mama Cloth Event! 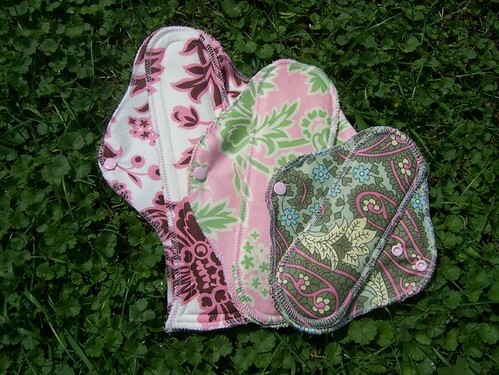 I have been so wanting to try cloth menstrual pads. I used cloth diapers for my son and loved how soft and hygienic they were. We had to use disposables when traveling, and I came across the last of the box in the closet the other day and was overwhelmed by how smelly they are (clean, unused!). Bleh. I rock a reusable Diva Cup, so why am I still using disposable liners and pads? She has put up detailed reviews of each pad so you can get a sense of the construction and the pros and cons and whether it will work for you. If you're wanting to give cloth mama pads a try — or even if it had never crossed your mind but now sounds intriguing! — head on over and win! Enter fast at The Cloth Diaper Report by Jan. 2 through Jan. 10. P.S. Can you believe it's January 2010? ?